We finally have a kickoff time, Duck fans. Thursday, ESPN announced one of the most anticipated non-conference games of the year will kick-off in prime time for the East Coast. These are the teams which have won the past two Rose Bowl games. September 12th, the Oregon Ducks will head to East Lansing, Mich., for the highly anticipated rematch against the Michigan State Spartans. The game will kick off at 5 pm PDT and be broadcast on either ABC, ESPN or ESPN2. Will Sparty bring the noise on prime time in East Lansing? Assuming ESPN keeps their top broadcast team in place, the game will be called by Kirk Herbstreit, Chris Fowler and Heather Cox. Last year, the broadcast teams were announced in late July. So far, this is the only Duck game to have a kick-off time set. 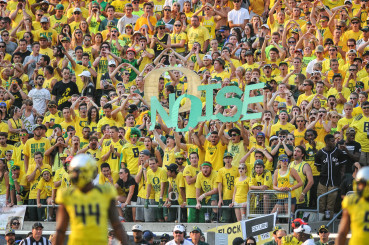 Last year, a bulk of Oregon’s kickoff times were announced on May 29th, so more slots could be coming soon. Last season, the Ducks hosted the Big-Ten power Spartans, winning 46-27 in Eugene. Wanna get away? Current flights from Portland to Lansing the weekend of September 12th are listed at $465 on Expedia. Stubhub has tickets ranging from $161 to $1025 per ticket.